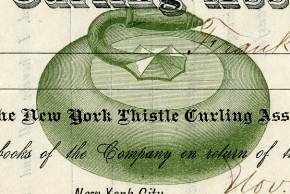 Beautifully engraved certificate from the Thistle Curling Association issued in 1890. This historic document was printed by the Law and Trade Printing Company and has an ornate border around it with a vignette of a Curling Rock. This item has the signatures of the Company’s President and Secretary, and is over 122 years old. Curling is a sport in which players slide stones across a sheet of ice towards a target area. It is related to bowls, boule and shuffleboard. Two teams, each of four players, take turns sliding heavy, polished granite stones, also called "rocks", across the ice curling sheet towards the house, a circular target marked on the ice. Each team has eight stones. The purpose is to accumulate the highest score for a game; points are scored for the stones resting closest to the centre of the house at the conclusion of each end, which is completed when both teams have thrown all of their stones. A game may consist of ten or eight ends. The curler can induce a curved path by causing the stone to slowly turn as it slides, and the path of the rock may be further influenced by two sweepers with brooms who accompany it as it slides down the sheet, using the brooms to alter the state of the ice in front of the stone. A great deal of strategy and teamwork goes into choosing the ideal path and placement of a stone for each situation, and the skills of the curlers determine how close to the desired result the stone will achieve. This gives curling its nickname of "Chess On Ice".